Photo copyright Gary Bowering 1997. All rights reserved. 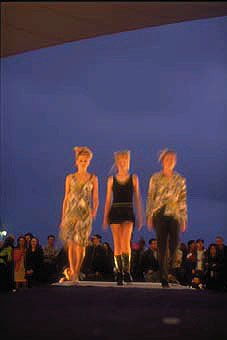 Another shot from the fashion show, part of the action in the week leading up to this great motor race around the city's streets. Again, this was shot outdoors on a wet night, and hand-held. This time with a little slow-synch flash. The way the models show motion while the crowd is (essentially) sharp is nice... well, I think so!! Agree/disagree? That's it for photography samples for the moment... keep checking back though.